This Kubota 37pc Screwdriver Set is made to get the job done. Designed with comfortable grip handles, magnetic Bit Holder and constructed of heavy duty carbon steel #45. Includes: 8pc Screwdrivers, 8pc Precision Screwdrivers, 20pc Bits and 1pc Bit Holder. The Phillips<sup></sup>, slotted and square recess screwdrivers in this 6 piece set feature a precision-machined tip for an exact fit. High visibility, oil and solvent resistant acetate handle provides a secure grip. Made in Canada and backed by Gray Tools worry-free lifetime warranty. Milwaukee<sup></sup> Demolition Drivers are designed for maximum jobsite toughness and durability. The forged steel shanks are compressed to the high impact steel caps to provide 2X longer life in demolition applications. Milwaukee Demolition Screwdrivers are designed for the jobsite and include Milwaukee's Limited Lifetime Warranty. 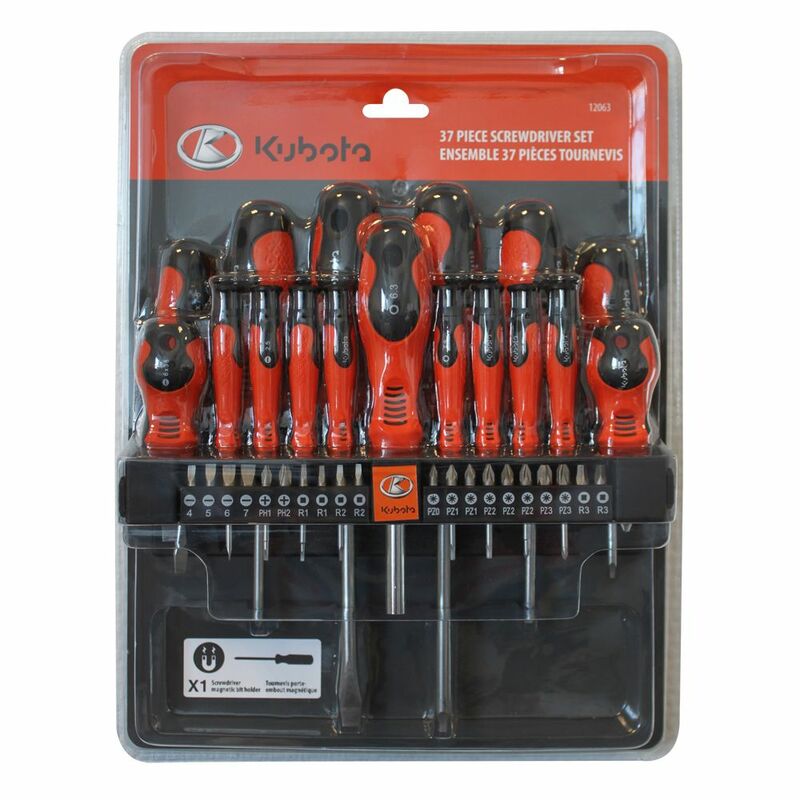 37 pc Screwdriver Set This Kubota 37pc Screwdriver Set is made to get the job done. Designed with comfortable grip handles, magnetic Bit Holder and constructed of heavy duty carbon steel #45. Includes: 8pc Screwdrivers, 8pc Precision Screwdrivers, 20pc Bits and 1pc Bit Holder.